People of the World ~ People from exotic places and from anywhere in my world. 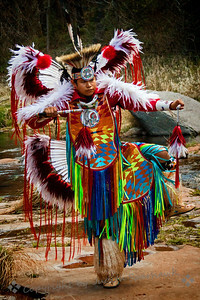 Young dancer Tyrese was just beginning his dance by the creek. Tyrese was dancing, ribbons flowing, and finally jumped into the air. In this shot both feet were off the ground--a fast shutter speed was needed to capture the moment. 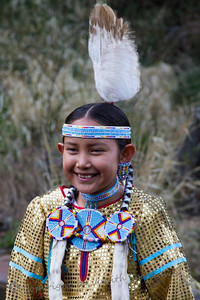 Between dances, young Kailayne breaks into a smile at a corny joke. Sedona, AZ. 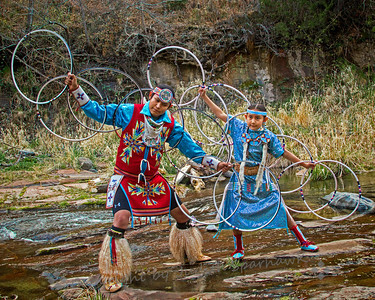 Brother and sister hoop dancers, photographed in Sedona, AZ. 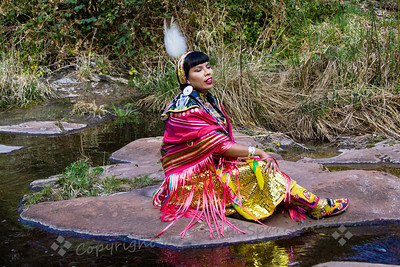 Navajo dancer, Yolanda, sitting by the water of Oak Creek, Oak Creek Canyon, AZ. 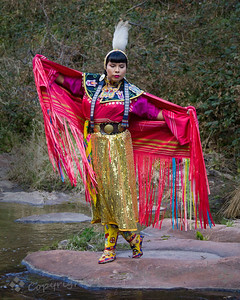 Yolanda, dressed for the Fancy Shawl dance, looking lovely in her sparkle and bright colors. 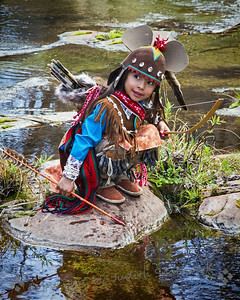 This darling young boy was one of the group of artists we photographed in Oak Creek Canyon, Sedona, AZ. Halayvi Davis. 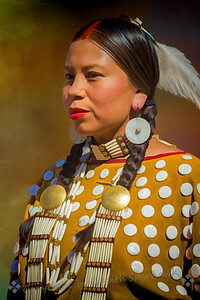 This pow wow dancer was lined up for the Grand Entry and ready to head into the dance. 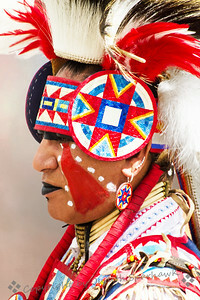 This pow wow dancer had very distinctive face paint and head band. I liked all the red in his presence. 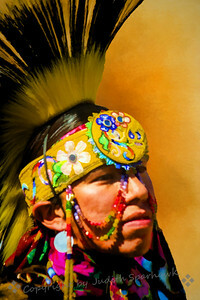 This is a painterly version of this image of a male dancer at the pow wow last weekend. 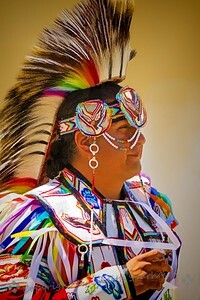 At the Morongo Pow Wow yesterday. 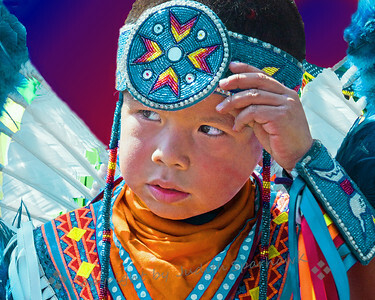 Morongo Thunder and Lightning Pow Wow, September 2017. 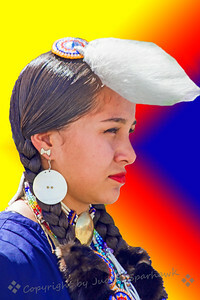 At the Morongo pow wow today it was quite breezy. 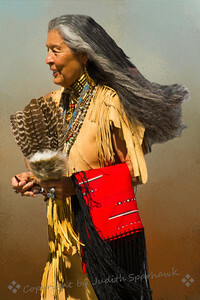 When this woman walked by, her beautiful hair was blowing in the wind. 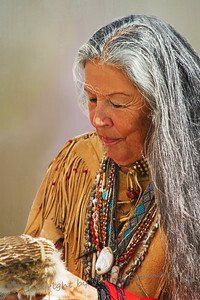 This is the second year I have photographed this woman at the pow wow. I love her simple garb and her flowing hair. 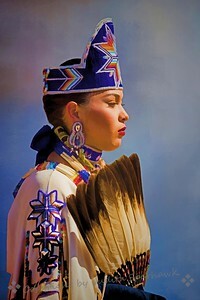 This beautifully dressed young lady was about to go into the dance, and arranged her braid at the last minute. 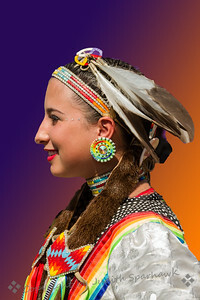 I went to the Morongo Indian Pow wow today, and had fun shooting some of the dancers in full regalia. This young lady was ready to go into the dance. I liked her bright colors and face paint. 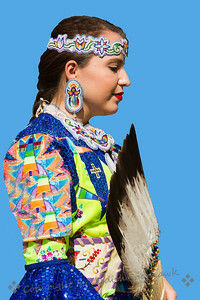 At the pow wow today, I photographed this girl as she was lining up for the fancy shawl dance, talking and laughing with her friends. 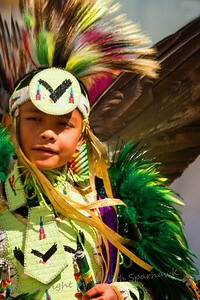 This young boy was one of the dancers at the pow wow today. 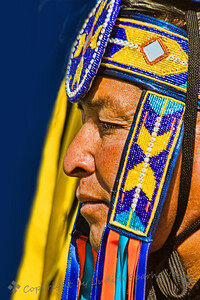 I liked all the feathers that made up his regalia. 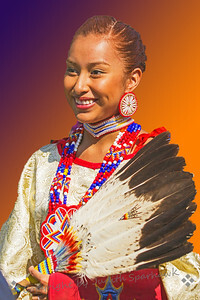 This lovely young woman was in line, about to enter the dance circle. 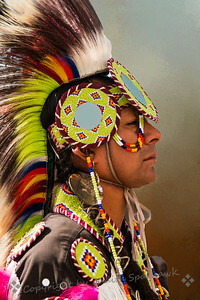 Pow wow, San Manuel Indian Tribe, San Bernardino, California. 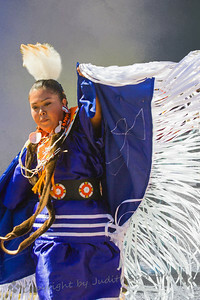 Another pow wow dancer from the San Manuel pow wow in San Bernardino, CA last weekend. 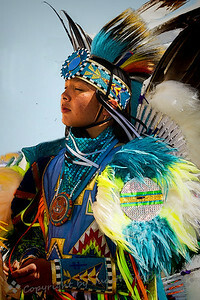 Pow wow of the San Manuel Trip of Indians. 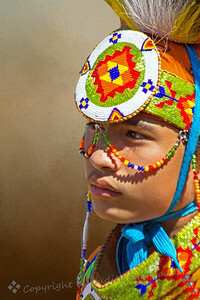 At the San Manuel Pow Wow today, I saw this boy in a quiet moment, and captured it. I liked the thoughtful look on his face. 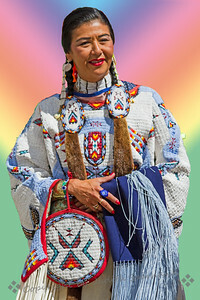 This lovely woman was heading to dance at the pow wow of the local Native American tribe. I used a textured background and then a painterly application. 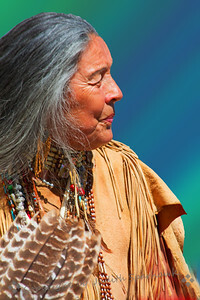 This woman was waiting to go into the dance and the pow wow. She was the only person I saw with a red part in their hair. 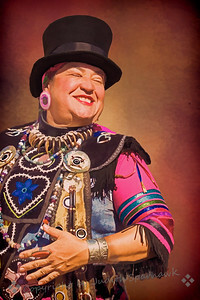 This woman was all dressed up for dancing at the pow wow. Her top hat was quite different from everyone else, and I don't know the background of it. I loved her claw necklace and the joyous expression on her face as she walked by. 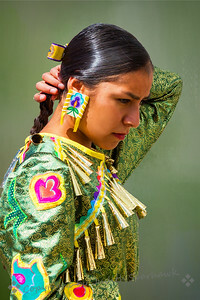 This girl was waiting for the dancing to begin at the Morongo pow wow. 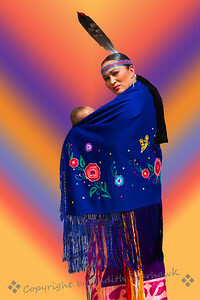 I was so happy to see this woman with her baby, waiting to go into the dancing at the pow wow. 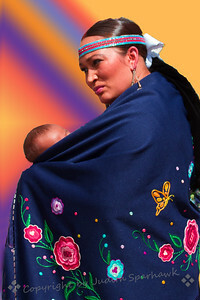 This beautiful woman and her baby were photographed at the Morongo pow wow today. 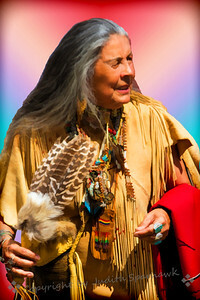 An alternate version of the image of this woman at the Morongo pow wow today. 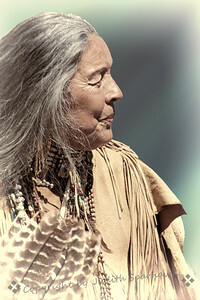 This older woman was photographed at the Morongo pow wow today. 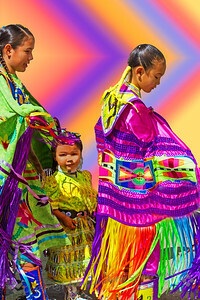 I processed it in Photoshop Elements and Topaz. 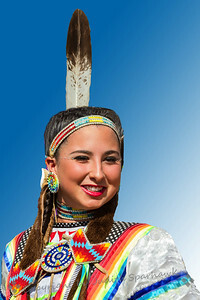 This lovely dancer was at the San Manuel Tribe Pow Wow in San Bernardino, CA, October 2014. 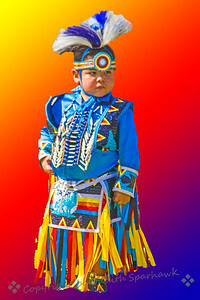 This very young dancer at the San Manuel Tribe pow wow was very cute as he toddled around the dance circle. 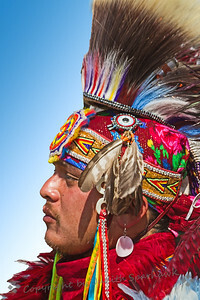 Waiting for the dance, San Manuel Tribe Pow Wow, October, 2014. 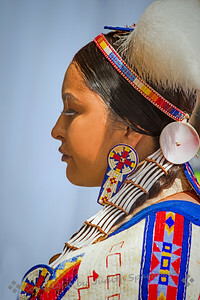 At the San Manuel Tribe Pow Wow today, I saw this beautiful dancer as she was heading into the dance. 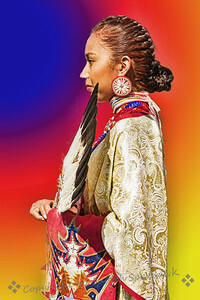 Each tribe has its own distinctive regalia; this one wore only one tall feather in her hair. 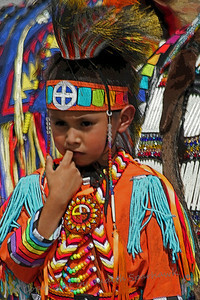 Waiting to Dance ~ This young dancer paused, while waiting for his group of dancers to enter the dance circle at the San Manuel Band of Indians' recent pow wow in San Bernardino, CA. 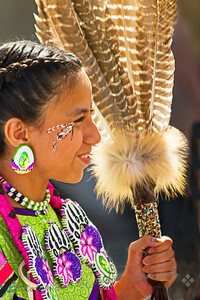 Feather Fan ~ This lovely young dancer was about to enter the dance circle, holding her feather fan. 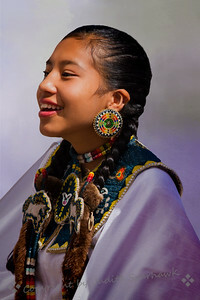 Quiet Moment ~ This young dancer paused before going in to dance with all the other dancers at the pow wow, San Bernardino, CA. 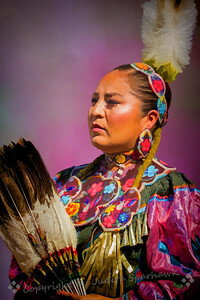 At the Pow Wow ~ This woman was photographed at the San Manuel Pow Wow last Sunday, in San Bernardino, CA. 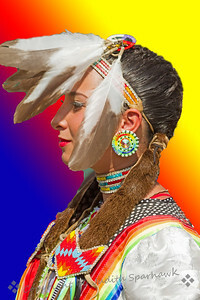 ~ I went to the annual pow wow of the San Manuel Band of Indians in San Bernardino, CA. 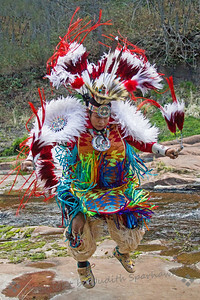 This man was photographed just before he went into the circle to dance. 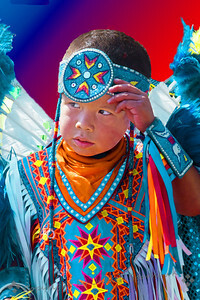 Little Dancer ~ This little boy was photographed at the Thunder & Lightning Pow Wow at Morongo this weekend. I thought he was cute, standing waiting to go into the tent, with his finger in his mouth.